As stated in our Video Surveillance Professional Installers? Thank You, No! article, cctv surveillance has long been regarded as something difficult that only experts can handle. That’s why for a quite long period of time, non-tech-savvies and regular-level computer users were hesitant to use video security installations made by themselves. The shift began not so long ago as computers and information became available for wider audiences, and simpler human-focused software was released. Xeoma is one of such software. Today we are going to bust the myths that stop you from creating DIY video security system right now. I don’t need it. You have insurance that will cover loss of valuables. But it will not save you from emotional stress. Moreover, there are some things no money can ever replace like family valuables, some things that are dear to you as a memory, or simply something that may be broken in course of burglary. I can’t afford it. The root of this stereotype is the myth of CCTV surveillance systems being so expensive that only major establishments can afford it. In fact, CCTV surveillance is becoming more popular every day, more manufacturers come to the market providing healthy level of competition that helps get prices quite affordable for users. I won’t manage it. You still think that installing Do-It-Yourself security systems is complicated? Take a look at these statistics: large enterprises point out that while sales of cameras go up, the demand for alarm systems decreases. It means that people around the world simply buy cameras and install video security systems themselves. Especially now, when various affordable and easy cloud solutions are available, where one just needs a camera to start. Too long of an installation. Home-made CCTV surveillance systems are advantageous here, too. It takes some time before a company you apply to arrives to install the system, while when doing it on your own, you define the time when to start, and can start immediately. Too long to get used to it and learn to use it. Professional systems may be. But do you really need those complicated techniques to keep tabs on what’s going on at your house? The basics are simple, every one can grasp them in no time. And you can enhance your system step by step, when you’re ready. Someone who has a video security system said they never actually had had a break-in. But perhaps this is just thanks to the system that no one dared to break into such a house. Most alarms only warn that someone has already broken in. Your first priority is to stop them getting in at all. I won’t have a minute of rest with all these alarms going off by themselves. When you picture an anti-burglar alarm system, in your mind it always goes off all the time and seems disturbing. In reality, however, motion detectors got so advanced that false alarms are quite a rarity. Moreover, if you are worried by a siren waking up the whole neighborhood in the middle of the night, you can set your system up to give innocent alarms to your cell phones or computer. See? The fears and objections against Do-It-Yourself CCTV surveillance are proved irrelevant. Your home-made video surveillance system can be made of items you have at hand, and it is simpler to tailor to your need than you think. Xeoma will help you with its simple user-friendly interface, all-in-one functionality and truly easy to work with algorithms. 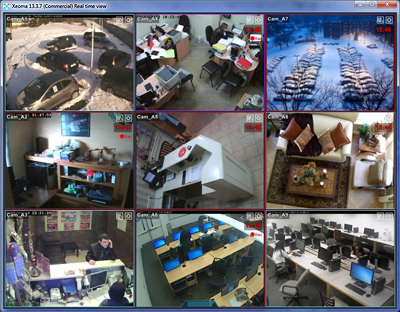 When you start Xeoma, it will begin to work with cameras found in your network at once. No initial server configuration needed, no admin rights required – Xeoma works with commonly used, optimal defaults. You can dig deeper at any time and change the defaults when you want finer tuning. Xeoma features impressive set of functionality available to users of any levels of technological background.